After initial hesitations, the family members of Sant Jarnail Singh Bhindranwale and a section of the Damdami Taksal today admitted that he (Bhindranwale) was killed in Operation Bluestar, 19 years ago. With the acceptance of ‘siropa’ (robe of honour) by Bhai Isher Singh, son of late Sant Bhindranwale, from Jathedar, Akal Takht, and the SGPC chief the two-decade old controversy over the death of the Sant ended at a function, organised at Dewan Manji Sahib, here today. With official announcement that Bhindranwale is no more, the SGPC and Akal Takht have accepted version of the state government which had declared in June 1984 itself that he (Bhindranwale) was killed in Operation Bluestar. The announcement on the death of Sant Bhindranwale which was held up by the Damdami Taksal since Operation Bluestar is likely to put Baba Thakur Singh, acting chief of the Damdami Taksal in awkward position. He had spread “disinformation” that the Sant is still alive and would re-emerge before Sikh Sangat at an appropriate time. Though Baba Thakur Singh is abroad these days, Mr Ajaib Singh Abhinasi from the Damdami Taksal admitted that Sant was no more. This was after a long time that radical Sikhs, including Mr Wassan Singh Zaffarwal, a self styled chief of the Khalistan Commando Force, Dr Jagjit Singh Chouhan, a votary of Khalistan, Mr Satnam Singh Paonta Sahib, senior leader of the Dal Khalsa, Bhai Narain Singh of the Akal Federation, Bhai Harminder Singh Gill, president, All-India Sikh Students Federation and Bhai Amrik Singh, a human rights activist came on common platform. Though it was the first public appearance of Mr Zaffarwal, but he was not given time to address the congregation with the result he left the place without uttering a word. However, senior Akali leaders of the Shiromani Akali Dal and the Shiromani Akali Dal (Amritsar) were conspicuous by their absence. The function was organised under the aegis of Akal Takht Jathedar Vedanti honoured the family members of those killed in Operation Bluestar and slain militants. Though the Dal Khalsa succeeded in bringing leaders of various Panthic organisations on one platform yet attendance at the function was thin. Addressing the congregation, Jathedar Vedanti announced that the “Genocide day” and death anniversary of Sant Bhindranwale would be observed every year on June 6. Nanakshahi calendar has already given the date of the death of Sant Bhindranwale as June 6. However, Mr Manjit Singh Calcutta, a former SGPC secretary, while addressing the function claimed that the SGPC had already announced the death of Sant Bhindranwale at the World Sikh Conference held here in 1995. The resolution, unanimously passed on this occasion strongly condemned the Army operation in June 1984 in which many innocent persons including women and children died. Another resolution stated that the Shiromani Gurdwara Parbandhak Committee took a historic decision to raise a memorial in memory of those killed during Operation Bluestar at its general house session last year. However, after a lapse of one year nothing has been done to raise the memorial. Another resolution took serious note of the denigration of Akal Takht. Without naming the Shiromani Akali Dal (Badal), the resolution stated, “the Sikh polity has compromised the supremacy and sovereignty of Akal Takht for political benefit. The seat of the head of the Akal Takht has been subdued. The working and recent decisions from the highest seat are an eye opener for all the Sikhs concerned”. In yet another significant resolution, it was urged that India and Pakistan should sign NPT (non-proliferation treaty) as any nuclear flare-up between India and Pakistan would wipe out the state of Punjab. The fourth resolution stated that, “Sikhs resolved to achieve the goal for right to self-determination under the UN norms”. These resolutions were read in the presence of Jathedar Vedanti. UNI adds: The situation became a bit tense for a short while when a section of the Damdami Taksal supporters opposed the ceremony and raised slogans. However, All-India Sikh Student Federation President Harminder Singh Gill intervened and succeeded in defusing the situation. A galaxy of Sikh religious personalities, including five Sikh high priests, Shiromani Gurdwara Parbandhak Committee (SGPC) Chief Kirpal Singh Badungar were present on the occasion. 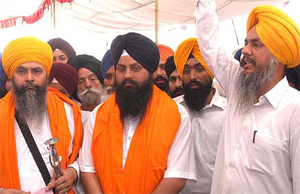 Several other leaders, including controversial Sikh leader of yesteryears Dr Jagjit Chouhan, Khalistan Commando Force (KCF) self sytled chief Wassan Singh Zaffarwal and some colleagues of Sant Bhindranwale also participated in the ceremony. Later, a Sikh congregation was also held at the Manji Sahib Dewan Hall to pay homage to ‘’martyrs’’. Coincidentally, when the prayers were held an Army unit also arrived to pay obeisance at Harmandar Sahib. Reiterating the demand for ‘Khalsa raj’, Khalistan ideologue Dr Jagjit Singh Chouhan appealed the entire Sikh leadership to unite under the aegis of the Akal Takht to work for establishment of “Khalsa raj”. “We want Khalsa raj not through bullets but in a democratic way, constitutionally and legally,’’ Dr Chouhan said while addressing.